Breeding habitat: Coniferous forests (preferred) and mixed forests. Winter habitat: Deciduous and mixed woodlands, parks, residential areas. Diet: Seeds of deciduous trees, shrubs, coniferous trees; weed seeds, buds, small fruits and berries, some insects. 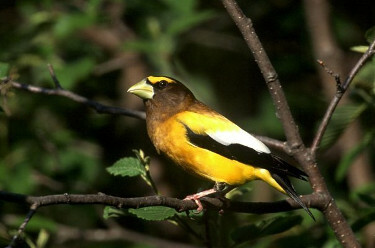 The male Evening Grosbeak is instantly recognizable. 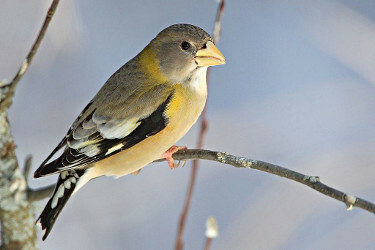 Females have large bills, short tails and distinctive call notes.